The Soaring Sheep: Wednesday's WIP and Fluffy Post! Wednesday's WIP and Fluffy Post! My camera wasn't very happy with the purple colour so it's not particularly true to life but it gives an idea of how it's knitting up. 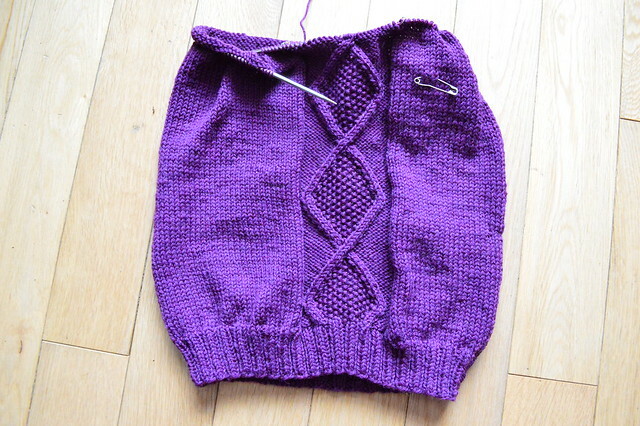 I've got one more repeat to finish and then it's starting the neck and shoulders I think. I don't tend to read too far ahead in a pattern or I get muddled! The pattern is called Umberto if anyone is interested. It's a lovely straight forward knit, I'm really enjoying it. They are both from The Laughing Yaffle and I love how vibrant the colours are. I've had to throw away a pair of knitted socks recently, the lack of nylon content meant they wore out very quickly. I'm looking forward to replacing them and increasing my stash of knitted socks. Can't beat them at this time of year, brr! Love that purple! And I'll check out the Laughinh Waffle as that yarn is gorgeous! 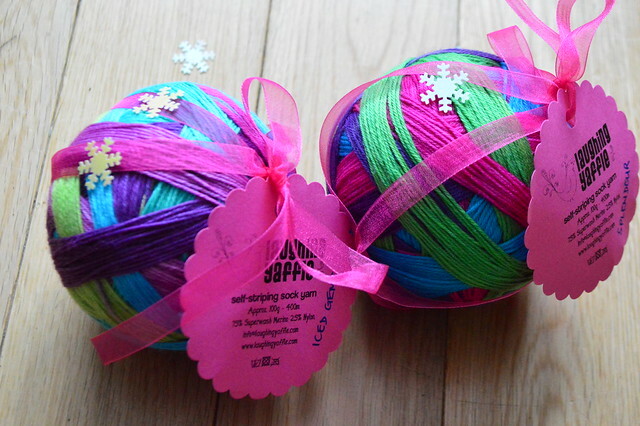 gorgeous balled up yarns! I am going on a yarn diet after Christmas, like I did last year. I like shopping in the fall then knitting through the stash during the winter and spring and most of summer. A great tradition. Love the purple that is challenging your camera! Purple is always tricky to get right, but yours looks lovely. Such a vibrant shade! I love the phrase 'cold sheep' :) as someone about to embark on just such a year, it's encouraging to know it's possible. It makes the treats at the end even more worth it, and I love your stripey yarn. Hope you get some awesome socks from it! Aah, I see you are with Ginny too! I'm glad you got your yarn so you could continue with your project. The sock yarn is gorgeous! I am having a hard time resisting the urge to go buy some. Congrats on making it a whole year without buying yarn. That sock yarn is definitely yummy and looks so celebratory with the bows - great pick!